So, last week three random occurrences correlated in my life and (at the risk of sounding like Carrie Bradshaw) I got wondering…what the hell is going on with our obsession with leaving this planet, full in the knowledge we have basically environmentally bankrupted it, in order to start over elsewhere with the same mentality? 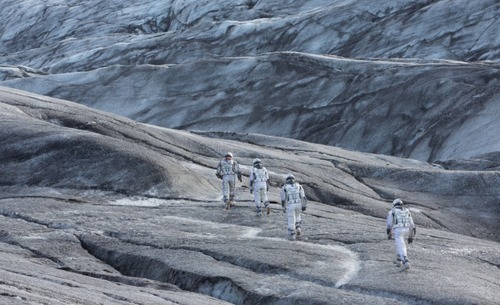 A friend bought me a ticket for Interstellar (not so random, I know). Due to the nature of my part-time job I managed to witness CaSE’s (Campaign for Science and Engineering) 24th annual Distinguished Lecture by Dr. Ellen Stofan, NASA’s chief scientist, entitled ‘Journey to Mars’. You, dear reader (keep looking out for the journalistic cliches), will probably learn nothing from this post other than just how simple it is to get me to stop in my tracks faced with three very normal day-to-day happenings. But I digress. Scientists here on Earth have, since the early 1960s, always been no more than 15 to 20 years away from human colonies in space by their own estimations. O’Neill, 38 years ago, outlined for the US a post-Apollo plan which included simulated gravity and human-friendly ecosystems made from raw materials mined from the moon’s surface. The illustrations to O’Neill’s book are amazing – they show a very human-centric and forward thinking approach to space travel – but they look like they have been snatched from one of Christopher Nolan’s story boards. What was once a matter of national and human pride has been converted, almost, to a matter of urgency through impending feelings of apocalypse and irrecoverable doom. Part of the issue is we understand our basic human needs all to well and have the determination, regardless of whether have the technological apparatus or faith in the current systems, to head off and adapt any other planet to be just like Earth. We have evolved here and we are convinced somewhere like this exists elsewhere as well. It just must. Because we are far too important for it not to. 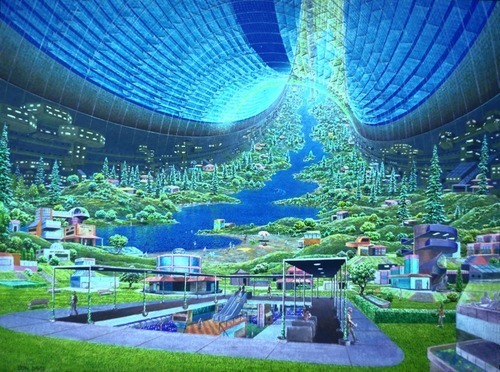 We have orbited entirely and based governmental programmes on science fiction’s concepts. We used this experience to launch award-winning books on where this would lead humans and now these (at the time graspable) concepts are being reabsorbed into moving images as ludicrous time-altering, mind-mending and morally ambiguous Hollywood epics as soon as they seem outdated or overambitious. Not only this but the recognition, as superficial as it may be, films such as Interstellar (not to mention wonderfully brash, boobie-laden shirts) bring to the public domain is being used a springboard for real space exploration programmes – most realistically the planned missions to Mars outline by Dr. Stofan at the Science Museum last week. So, we have may have made a round trip but I doubt we will end up back where we started because it was too good to be true in the first place.